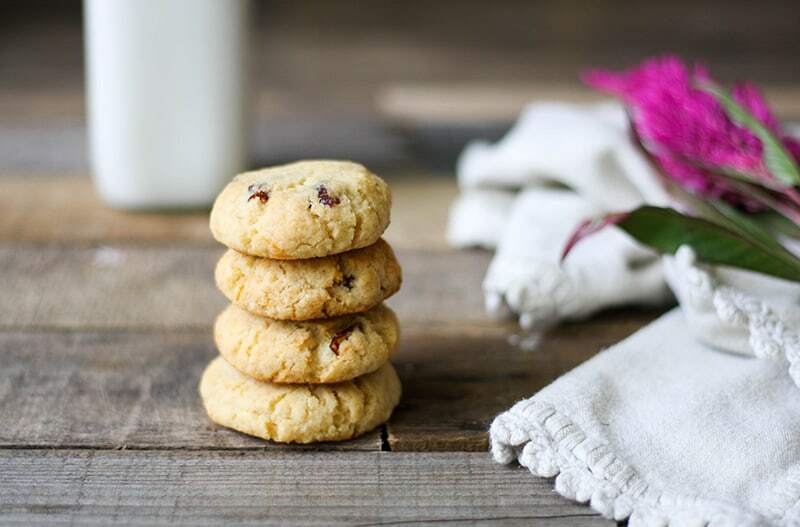 This Autoimmune Protocol (AIP) friendly recipe makes the perfect egg free and nut free Cranberry Grapefruit Cookies you’ll ever try. No one will guess that they’re gluten-free, nut-free, and autoimmune paleo friendly. 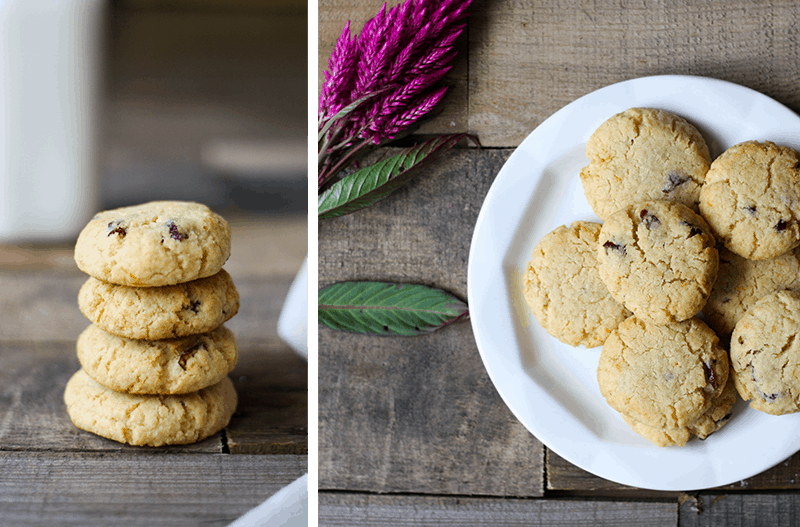 Health, fall flavors, and dessert, all in one fluffy cookie. Grab the recipe below. If you’ve been following my AIP reset, you know my goal is to kick up the autoimmune diet by focusing my meals on healing and nourishing foods. The first time I followed the Autoimmune Protocol, I prided myself on being able to recreate many of my favorite recipes with 100% AIP compliant ingredients. Now 2 years later, I’m expanding my AIP recipe repertoire to include insanely delicious recipes that are not only AIP compliant, but also include incredibly healing ingredients. 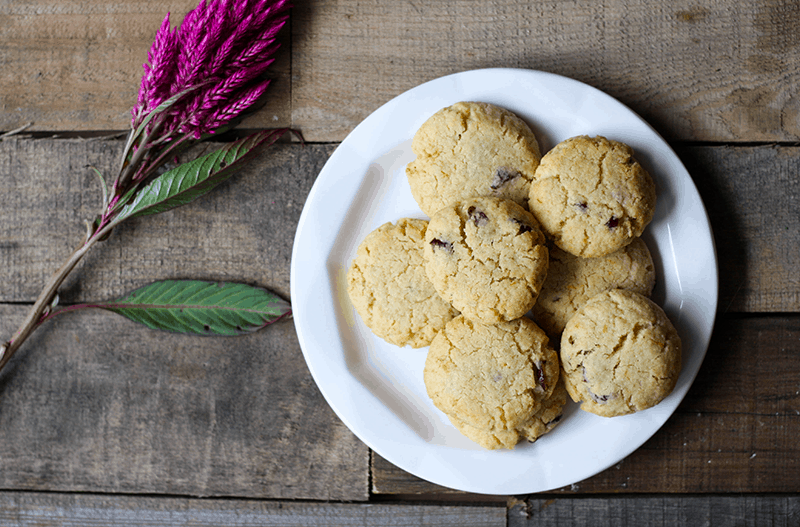 Believe it or not, this recipe for Cranberry Grapefruit Cookies is one of them. 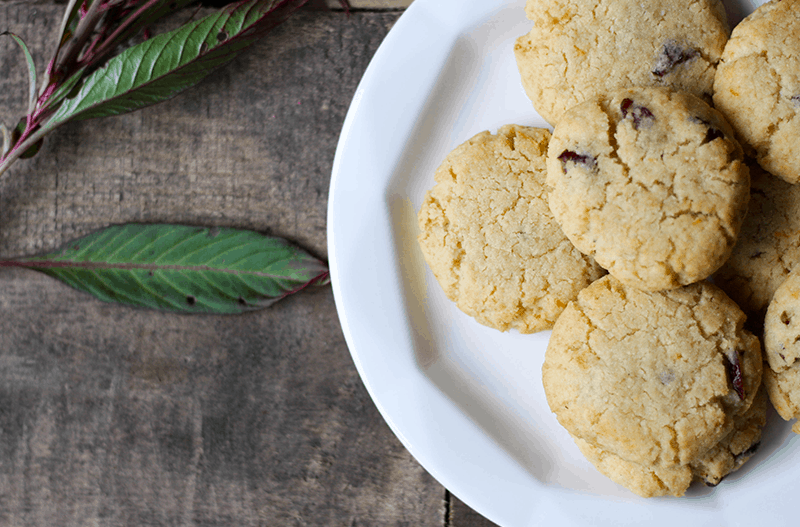 Let’s break down the ingredients included so you can understand just how these AIP Cranberry Grapefruit Cookies can boost your AIP healing. These cookies are relatively low in sugar. At the most, they each have about 1-1/2 tsp of pure, grade B maple syrup. This is only about 6 grams of carbs/sugars, and since it’s in the form of pure, grade B maple syrup, it also comes loaded with vitamins and minerals. Remove: AIP takes care of this with removing the common food allergens – eggs, nuts, grains, gluten, dairy, soy, corn, legumes. Replace: If you have an autoimmune disease (even if you don’t! ), you can bet you have some degree of digestive distress and inflammation. This means you’ll want to add in things that promote healthy digestion and absorption, such as digestive enzymes, bile acids or salts, and/or hydrochloric acid. In my free AIP ebook, I suggest drinking a homemade apple cider vinegar drink 30 minutes before eating to promote healthy digestion. Re-inoculate: This is where the prebiotics and probiotics come into play. In addition to replenishing the good bacteria in your gut with probiotics, you’ll want to support them by consuming both prebiotic foods (like the xylitol in this recipe) and fruits and veggies that are high in soluble fiber (like the coconut in this recipe). Repair: If you’ve made a strong effort to focus on the first three steps in this 4 R protocol, then “repair” should happen fairly quickly. A few ways to promote the repair of your gut would be to add gelatin (which this recipe includes), collagen, and aloe vera juice into your daily diet, and choose to supplement with L-glutamine, zinc, foods high in omega-3 fats (like the palm shortening and beef tallow in this recipe), and vitamins A, C, and E.
Gelatin is often referred to as “cooked collagen”. The benefits, vitamins, amino acids, and minerals are almost identical to collagen peptides, but the differences lie in the application. Hydrolyzed collagen is easier to mix into cold liquids and won’t gel up, while gelatin does just that, specifically when blended into hot drinks. In this recipe, the gelatin acts as a replacement for gluten. Gelatin, like gluten, acts as a glue to give these cookies stability. 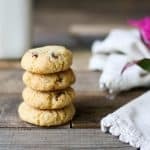 If the beneficial aspects of the ingredients haven’t convinced you of trying these Autoimmune Protocol Cranberry Grapefruit Cookies, the flavor and texture should. 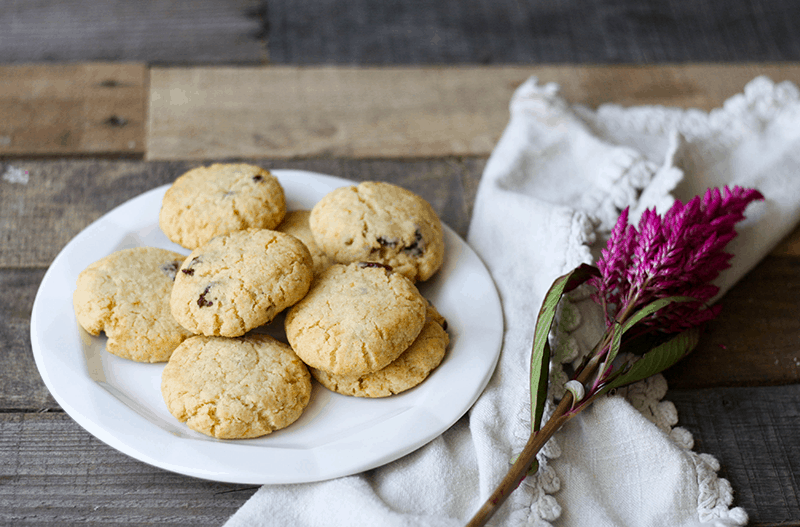 I brought them to my Paleo Girls Night (full of girls who are grain free, but not necessarily AIP), and I received numerous texts the following day about how my friends were still thinking about how perfect these cookies were. So whether or not you subscribe to the Autoimmune Protocol diet, try the recipe below and report back. You won’t be sorry! In a large bowl, combine tallow, shortening, xylitol (replace with coconut sugar for AIP), maple syrup, grapefruit juice and zest with a high hand mixer. Form into 8 large or 12 small cookies, and place on a parchment lined cookie sheet. Press down lightly on each cookie to flatten slightly. Is there any substitute for the xylitol? Would something like coconut sugar or maple sugar work? I’d think any granulated sugar like coconut or maple sugar would work, but I haven’t tested it. If you try it, please let me know how they turn out!